"Skating to Class:" "Shampoo Alley:" "Cycling the Grid:" "Boutique:" "Red Van:" "Be a Teacher:" Post-Script: I live in the northeast suburban grid of Albuquerque, having to travel by car or motorcycle to make my pilgrimage to the more densely concentrated parts of town like the Student Ghetto or Nob Hill, but do so virtually every week, for inspiration and change of pace from the endless, nondescript sprawl of the outlying areas of town. It is here that I find my inspiration, despite the fact of my repetitious photographic studies that have been ongoing since 2009, this small collection of images from this morning's outing a prime example. Photographs via Lumix G5, typecast via Corona 4 on 6" wide endless-roll-uh-paper-typing (ERUPTion). I was emailed, a week or so ago, by a young lady who runs a blog, and is also a journalist. She asked if I could supply her with an image of a manual typwriter typing, of a particular phrase that she supplied. I obliged her, quickly hammering out the phrase on my Remington Ten Forty, scanning it and emailing it to her, in a mad rush late in the evening after work. Then I thought nothing about it until today, when she emailed me with a link to her article, for Yahoo News, about how analog technology continues to mysteriously defy the onslaught of the digital. It was a good article I thought, and I was pleased to see my little scanned typing in the article, too, imperfections and all. "Look Left," the sign states, painted on the asphalt roadway. It's Monday and Hunter and I are trekking through the Nob Hill district of Albuquerque, on a photo stroll. He came equipped with a German-made Kodak Retina IIA, circa the 1950s, and I came equipped with a Lumix G5, circa 2012. His camera is loaded with color film, mine a memory card and battery. Look Left. It could be a political statement, especially given the proximity to the U.S. Presidential election, and our proximity to the progressive heart of Albuquerque, Nob Hill. "Look Left" is a warning, to the careless at heart, who might dare to step off the curbside into oncoming traffic, that stops for no man, regardless of political persuasion. Life is full of these little warnings, if we would but listen, take notice, heed the warning signs. The terminology of photography seems to have taken on the language of warfare: hunting, capturing, shooting. It implies an aggression out of character from its nature, that being painting with light. Perhaps we can regain that lost sense of purpose by shooting the shooter, hunting the Hunter. Sometimes you can't help it, your presence is irrefutable, in life as well as in taking photos, your presence casts a shadow that becomes part of the tapestry of the landscape being documented, not separated from it, the observer becoming part of that being observed. If it had arms, it might look like some makeshift robot, at least from the opening photograph. Okay, I didn't work that feverishly on this project, else it would have been finished in about half the time. But I'm pretty pleased with the way it came out, providing it actually does what it's advertised to do, which is to keep film clean while drying. It is tall, however, but light in weight. A 36-exposure roll of film is about 5 feet long, so the cabinet had to be about 6 feet tall to provide enough extra room for the electrical bits like the fan, switches and wiring, and the HEPA filters and air inlet and outlet. But it rolls on casters, and should be easy to roll into a corner of my office, or stay out in the darkroom, while the film is drying. A friend of mine just this week purchased a Kodak Retina IIA camera, a German-made rangefinder from the 1950s, and he's anxious to begin processing his own B/W film alongside mine. This cabinet should, we are hoping, facilitate our renewed interest in film photography. Typecast via L.A.R.O.P. on Remington Ten Forty with yet more ribbon feed problems, images via Lumix G5. George is not my friend's real name, but I'm certain he'll recognize himself when he reads this. As for my sporadic writing, I've found, at least for this week, that the inclusion of the L.A.R.O.P. 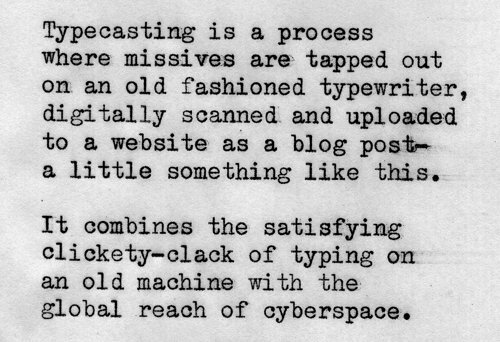 into my typing methodology has freed myself up to write more spontaneously and more often. I have several pieces, unposted as blog articles, that were written just because I felt like writing them, almost like journal entries, and the Remington sits on my office table with L.A.R.O.P. paper already threaded in its platten, ready to go at a moment's notice. As for the mechanics of using the L.A.R.O.P., I've found that the thin paper tears off easily, at the end of a piece of writing, by using the square cross-sectioned paper bale in front of the platen. The ink got a bit thin at the bottom of the scroll, the Remington's ribbon feed remains problematic. What I didn't mention, because I was too involved in typing to think deeply about it, was how to plan for page breaks after the fact, the realization that you have to cut your scroll up into sheets for scanning. I suppose I could plan for such breaks and give myself some additional space between paragraphs. I scanned the sheets with a stack of white printer paper as a backing, it keeps the curly paper flat, and makes the paper's background appear whiter - it's airmail thin, and whatever's behind it will show through somewhat. Alternatively - this just came to me - I could fashion a template from black craft paper, a 6" wide window of a certain length, and could simply place the template upon the scanner's glass and move the scroll past the window for each section that needs to be scanned. This would keep the scroll intact. I also thought of letter-writing, and the prospect of folding the scroll (it's the perfect width for small envelopes) accordion style. My dear Aunt in Colorado Springs, who herself has an old upright Underwood, might be amused at receiving such a missive. I’ve been exploring, during the last few years, street photography using digital cameras. While such cameras of affordable price are well suited to family and vacation snapshots, using such a camera for capturing fast-changing street scenes requires quick shutter response, fast optics and good low-light performance, all in a diminutive package, specifications that, until recently, were not to be had with basic affordable digital cameras. I was an early adapter into the micro-four-thirds camera format for just this sort of purpose, being able to interchange high-quality, fast lenses onto a camera body of fast response and good low-light performance. My first micro-4/3 camera, a Lumix G1, I’ve used for almost 4 years, but I’ve been less than completely satisfied by its shutter response and low-light performance. Now, I’ve replaced the G1 with a Lumix G5, a camera that’s 3 generations more evolved. Today I ventured forth on the streets of Albuquerque, in search of street scenes, in an attempt at trying my hand at this elusive practice using this new tool, and have positive news to report. The G5 exhibits dramatically improved low-light performance. I was able to shoot at ISO500 in cloudy morning light at shutter speeds fast enough to capturing moving subjects with little or no motion blur. The images retain very little electronic noise up to about ISO3200, far in excess of the G1’s limit of around ISO800. A new feature to the G5, one that I was anxious to try, is the electronic shutter. Mirrorless cameras function by keeping the shutter open, permitting the live scene to be viewed and composed. When the shutter is tripped, it first closes to reset the sensor’s pixels, then opens and closes to make the exposure, finally reopening to reset back to the live view mode. This close-open-close operation of the mechanical shutter brings with it added delay in capturing an otherwise elusive image. The electronic shutter, I was pleased to find, dramatically quickens the camera’s response time so as to seem virtually instantaneous. It also operates entirely silently, further improving the already stealthy nature of the camera, so silent that images can be recorded entirely anonymously in extremely quiet and intimate surroundings. The one caveat to using the electronic shutter is that moving subjects - or rapidly panning the camera while releasing the shutter - can cause a distortion in the image. In this case, use of the camera’s mechanical shutter is recommended. The result is a photographic tool that’s a game-changer, at least for me, in the genre of street photography. These small Lumix lenses were already fast-focusing on the old G1 body; now they’re even quicker, and deadly silent. The G5’s new Dynamic Monochrome mode also delivers excellent black and white images, better even than the older G1’s well-received Dynamic Black & White mode that was already noted for producing results that were hard to emulate from its raw files using more traditional post-processing software. These in-camera JPEGs are simply amazing, promising a workflow from camera to web, via the iPad, that’s quick and convenient. I’m excited at the prospects for using this new tool, and hope to share with you more images to come.